"Are You Considering using Lake Garda Trains? Find out More About This Way of Travelling"
Lake Garda trains are a great way of getting to and from the lake. 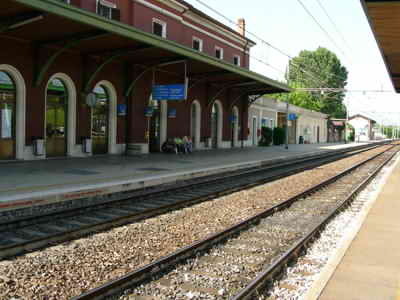 Desenzano and Peschiera both have a station on the main Milan to Venice (west to east) railway line. 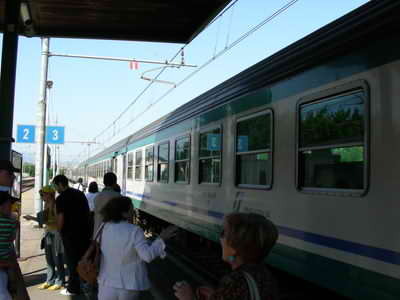 This means that from any airport we have mentioned, you can get a train to the south end of Lake Garda. Some airports require a shuttle bus to the railway station and some journeys may require you to change trains at some point (usually when you hit the main line). One of the major plus points about rail travel in Italy is that the cost is cheap. It can also be the quickest way to get to congested locations and you don't have to worry about parking your car when you get there. This is particularly true when travelling to Venice, as it can get pretty busy on the roads...and then when you finally get there you can get charged a lot to park your car. For this reason we would definitely recommend using the trains to busy and popular tourist destinations. The trains are usually on time and we have found the service to be pretty reliable. The downside to relying on trains to get around is, since Lake Garda is located partially in the mountains, the railway can only run east to west. In reality, this means that you can only get to Desenzano and Peschiera and the bottom corners of the lake. Although there is another railway running north / south to the east of Lake Garda, it is too far away to be any help travelling around Lake Garda. So train travel to the bottom of the lake is fine, but you can not get to any other location on the lake by train and therefore you need to travel by boat or on the roads. The other thing to watch out for is occasionally the Italian train staff go on Strike, so there are days when very limited services are available. Eurostar: These (ES) trains are the fastest and most expensive way to travel by train in or to Italy. These trains only usually run between the major cities and are designed for speedy, comfortable and executive style travel. Carriages are air conditioned and roomy with a high level of services available. Intercity: These (IC) trains are the more basic trains used for local travel between towns and cities. They run at slower speeds and obviously stop at more stations allowing more choice of destinations. It is a lot cheaper using this service and, although you may not get all the frills of the Eurostar, we have found the carraiges to be perfectly adequate. And if you want a little more comfort, there are first class seats available. Diretti and Interregionali: These trains are very basic and go to all the small stations, so can be slow if you are doing a long journey. You can get to any station with these trains, but the service can be less reliable. You can not pre-book for this service like you can for the others. Reserving tickets for long trips can be a good idea, but for most trips of a couple of hours or less, we have found this to be unnecessary. You can buy tickets at the train station from the kiosks or from automatic ticket machines. The kiosks can often be very busy and it is often quicker to use the ticket machines. These machines can be used in any major language and take credit cards or cash. Remember that in Italy it is mandatory to validate your ticket on the platform before boarding the train. Simply insert your ticket into this small machine and it will be stamped (the ticket inspectors will check this). For more information on Lake Garda Trains, click here to see the national railway website.